That also, and firstly, means implementing all the preparation and produce some good prototypes, before getting a good screen printing, stable and secure. I took some pictures, kinda sequence of the progress of the followed procedure. 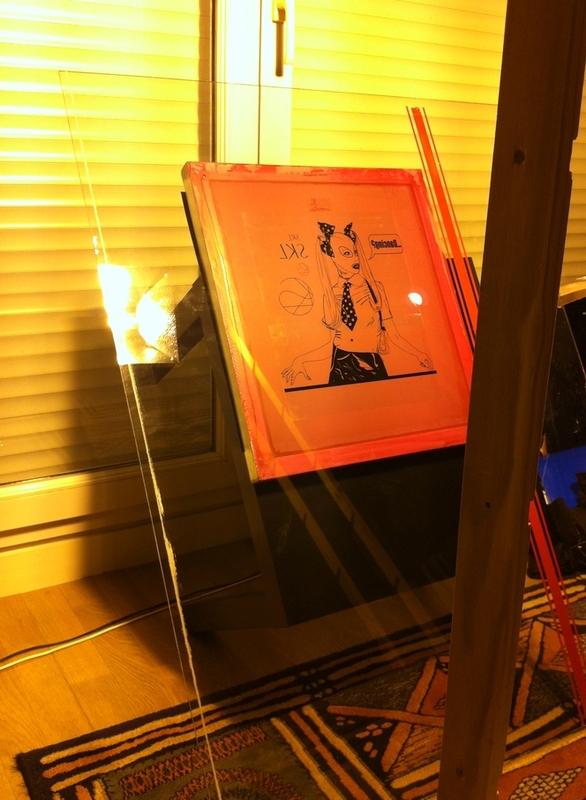 First, adjust the artwork on the frame, put on the homemade screen printer, positioned with the T-shirt, ready for printing. 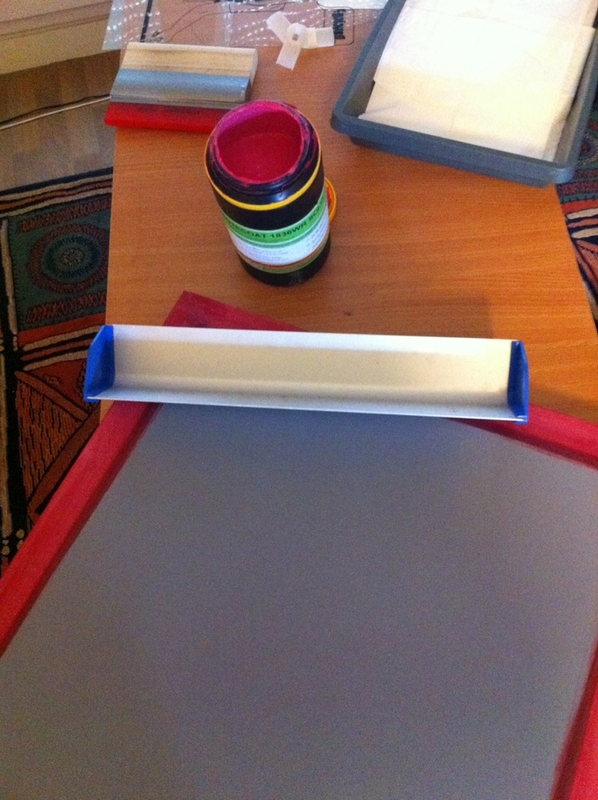 Adjustement of the artwork, before coating the frame stretched silk with the photosensitive emulsion. Then, once the artwork is positioned well, marks found on the frame, it is coated with photosensitive emulsion, two layers are applied on each side of the screen, spread smooth and uniform manner, avoiding drippings . After drying, it is then placed behind a glass plate, and exposed to bright light to ‘burn’ the photosensitive emulsion in the tense silk and spare parts protected through drawing. 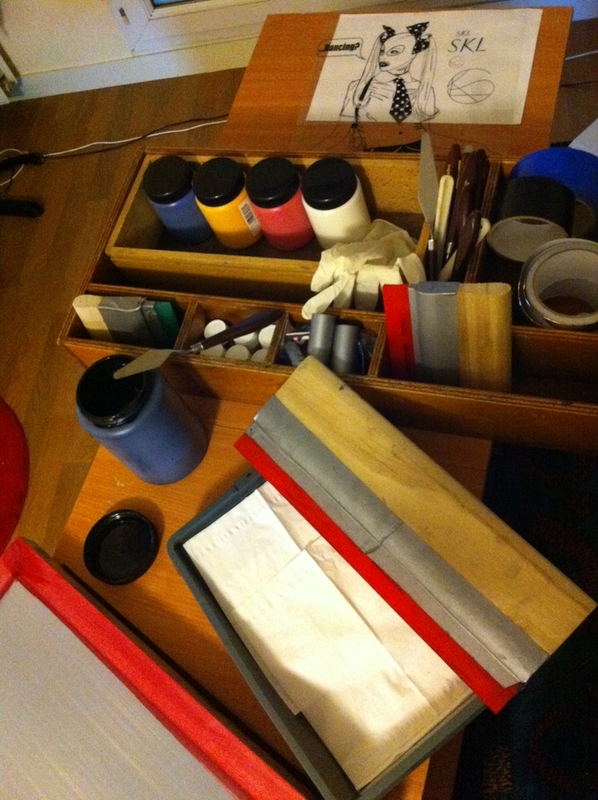 Currently expose the frame stretched silk with the photosensitive emulsion. Note the dark and clear vertical stripes, generated by the iPhone camera. 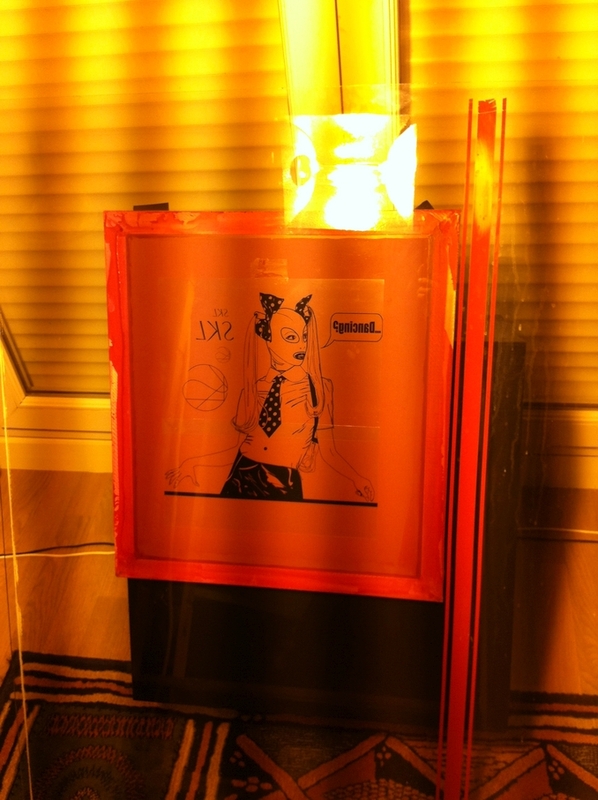 After a few minutes, the exposure is complete, the screen is then passed under running water in order to release the emulsion that is not caught in the mesh frame silk by the ‘burning’; the frame is ready to let the ink to print the t-shirt. I have a big pot of black ink, water based, to make these impressions. There are also other different colors, such as blue, yellow, red and white, in smaller pots, to make experiments more colorful compositions of the same drawing. The Squeegee has the right size for the pattern. 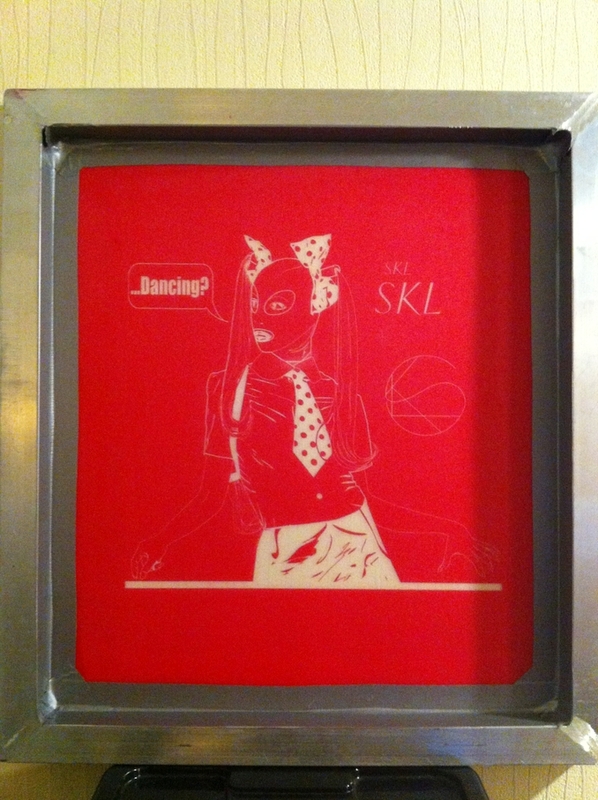 First tee-shirt screen printed well. The prototype is OK, a series of prototypes follows. I still spotted some defect in the screen printing machine homemade, actually the width of the sleeve, which hosts the T-shirt printing, I’ll rebuild for a greater one. 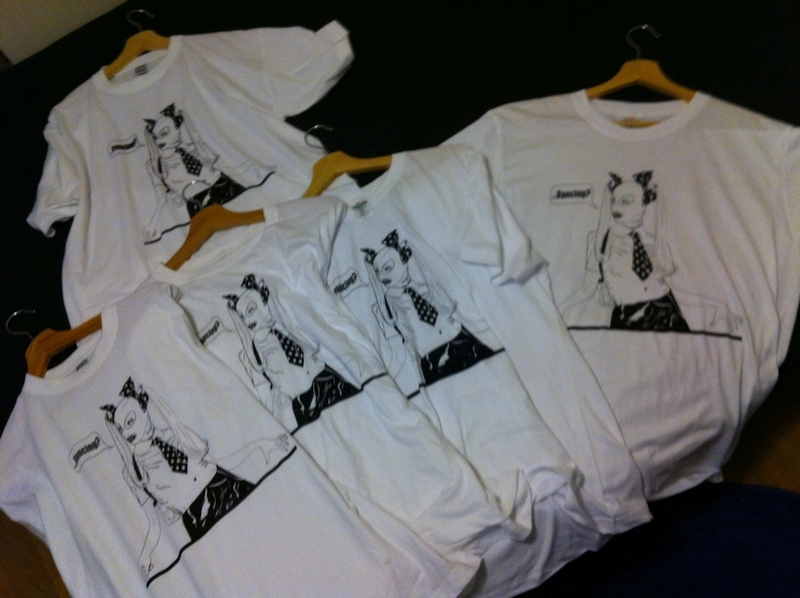 First set of screen printed T-Shirts / only euro-L size at the moment!